Some might say there’s nothing to do in my little town. We have about 5,000 residents, and many of them are farmers (yep…real live cowboys). Until a couple years ago, the tallest building in town – three whole stories – was the Templeton Feed and Grain. (For all you urbanites, a feed and grain is a farm supply store where you buy hay, grain, and other things that livestock eat). As far as I can tell, Templetonians come out mostly at major holidays, such as the High School’s Homecoming Parade (ha). On Wednesday evenings in the summer, the park is the place to be. Apparently late to the trend, my boyfriend and I recently discovered these summer events. It turns out they’re actually a lot of fun…mostly because everyone brings food and wine and enjoys the beauty of our Central California town on a summer night, and you always see at least a handful of people you know. 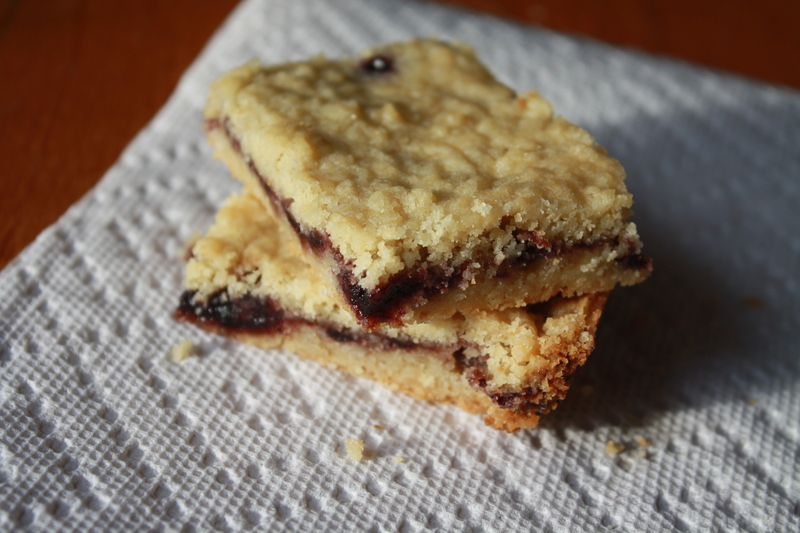 Last week, Brian and I brought his parents with us, and wanting to impress them with my baking, I found this recipe, which is delicious but also makes a great picnic dessert. Brian’s mom loved them, and so did my coworkers, to whom I brought the leftovers to the next day. Delish! In a medium bowl, whisk the flour, baking powder and salt. In another medium bowl, using an electric mixer, beat the butter and sugar at low speed until combined. Beat in the egg yolks and vanilla. Add the dry ingredients and beat at low speed until a soft dough forms. Halve the dough and form into logs. Wrap the dough in plastic and refrigerate until firm, at least 1 hour. Preheat the oven to 350° and butter an 8 1/2-by-11-inch glass baking dish (Note: mine was 9-by-13 and this works fine – they’re just a little skinnier). Working over the baking dish, coarsely shred 1 log of dough on the large holes of a box grater, evenly distributing the dough in the baking dish. Do not pat or press the dough. Using a spoon, dollop the preserves over the dough and gently spread it in an even layer. Grate the second log of dough on top. Using a rubber spatula, tuck in any shreds of dough sticking to the side of the baking dish to prevent them from burning. Bake the shortbread on the bottom rack of the oven for about 35 minutes, covering it with foil halfway through baking. The shortbread is done when the pastry is golden all over. Let cool completely, then cut into 24 bars. 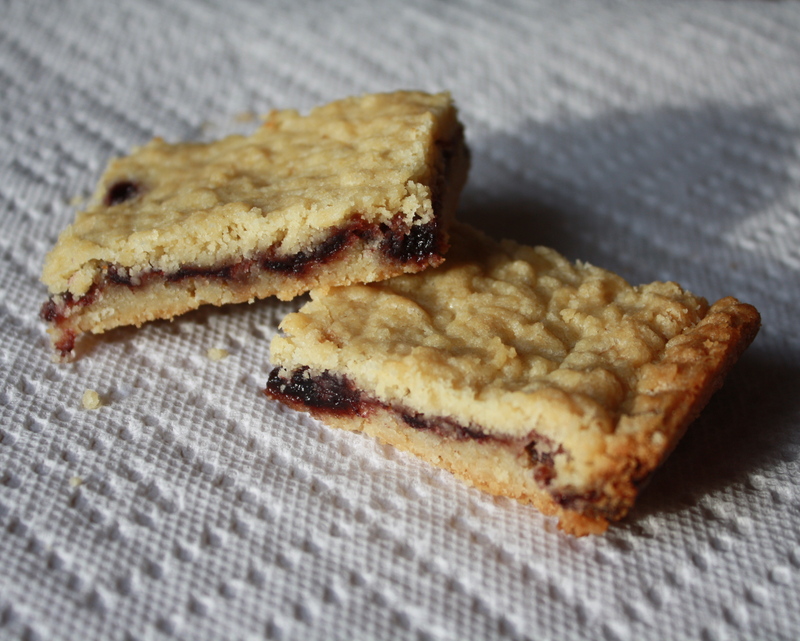 This entry was posted in baking, cookies, dessert, fruit and tagged blackberry, cookie, food photography, fruit, picnic, shortbread, Templeton by Laura Zolnoski. Bookmark the permalink. these are fantastic. actually, i want one right now!